I remember when my best friend Rachel and I went to Chicago and on our last day there we went out to a fancy dinner at a fancy restaurant and did the “chef’s choice” meal. It was like 5 courses of whatever the chef decided to make for us. It was the first time I’d ever tried ahi tuna and it was the first time I’d ever had butternut squash. It was a creamy butternut squash soup in an espresso-sized cup and it was so amazing; I wondered, how had I never had butternut squash soup before?? I wanted to make it for myself. It sure took me long enough to give it a try…Like 10 years! But finally, I tried. I searched for awhile to find the right recipe. I remembered it being pretty sweet and I found a lot of recipes that claimed it was so sweet it could almost be a dessert. That wasn’t quite what I was looking for. I wanted savory, with a hint of sweet. 1 medium butternut squash, about 6 cups cubed. 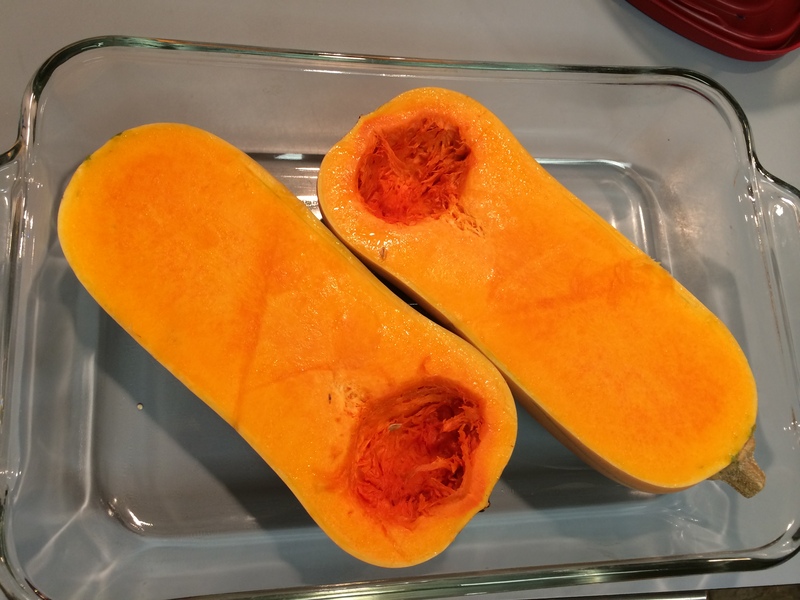 Halve squash and place cut side up in a baking pan with ½" of water. bake uncovered for about 45 minutes. Squash won't be fully cooked, but slightly tender. Cool.Using a vegetable peeler, peel of outer skin and scrap inside to remove seeds and stringy fibers. Cut into cubes. Should yield about 6 cups. (I think you can actually cheat on this and get pre-cubed squash in the produce section of your market). In a Dutch oven or large pot heat butter and oil until hot and shimmering. Add shallots and stir, for a minute or two. Add garlic, stir. Add squash and broth and bring to a boil. Add thyme and bay leaf, reduced heat and cover. Simmer on low about 45 minutes until squash is tender. Remove bay leaf and thyme sticks, if there are any. Puree soup using an immersion blender or upright blender, until smooth. Return soup to pot, add half and half or cream to thin to desired consistency. Finish with toasted, chopped cashews and a drizzle of cream. It sounded pretty good to me! I knew I’d add a little bit of extra things here and there that I had seen from other recipes I liked. For example, a few recipes called or a pinch of cayenne pepper and I LOVED that idea. Other than that I followed the recipe pretty closely, except for the bay leaf (didn’t have one) and I added cayenne. I put it all in my Dutch Oven and let it simmer down. I used my immersion blender (which I LOVE) to puree it up. I taste-tested the soup after pureeing it and added a pinch more of the cayenne pepper. Once I felt like it was good, I dished it up. I thought it was a little odd that the recipe called it “Butternut Squash with Toasted Cashews” when the cashews were really just a garnish. I read the recipe a few times to make sure I wasn’t skipping a step. Sure, the cashews were nice and added a nice crunchy texture to the soup, but I don’t know that it added anything else beyond that. I originally thought the cashews would be ground up and mixed in. The texture was super creamy. It was a little too close to baby food/applesauce in consistency and I could have added more milk to it to make it more soupy. I served the soup with a green salad (swiss chard, spinach and kale) with Bleu cheese and a raspberry vinaigrette dressing. I also had one large cheesy kaiser roll that I split in half for Michael and I to share. Michael and I both liked the soup a lot. It was pretty easy to make. I would add more spice to it next time I think. I got 4 servings out of this recipe and that made it around 150-165 calories a serving. Super low but it was filling and I didn’t feel like I was deprived of food afterwards or hungry in an hour. I had some leftovers that I took to work for lunch on my two rest days (there weren’t enough calories in it to eat on a gym day). It was just as good the next day. A little bit of spice, but not too much. It was creamy and the best part— SUPER filling for less than 200 calories! 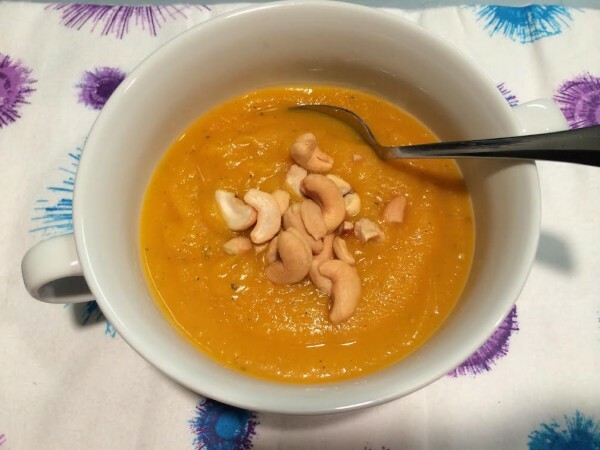 I will be experimenting more in the future trying to find the perfect squash soup recipe. Do you have a favorite? Please share! I LOVE butternut squash soup. We grew some butternuts in our garden this year just so we would have some for soup! 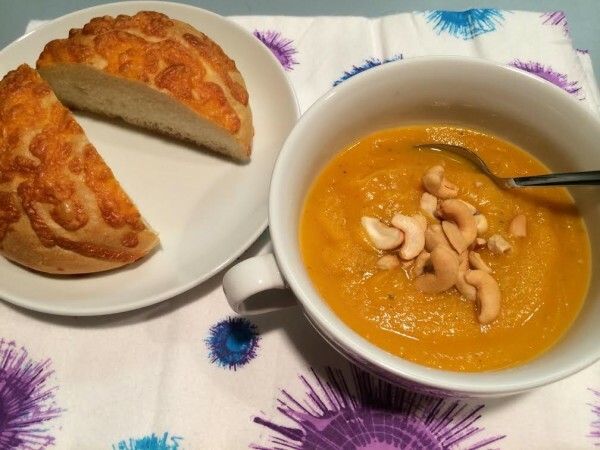 Our favorite recipe is “Butternut Squash Soup II” on allrecipes.com. It’s loaded with veggies and just has good flavor. Very filling, but with not a ton of calories. I always feel like it’s a great way to sneak in a ton of healthy veggies in my diet. You’ll have to try it and let me know what you think. Thanks! I will look for that recipe. It sounds great and I love the idea of adding other veggies to it. I love delicata squash because you actually do NOT have to peel them – it’s a thin skin and is easy to chew when the squash is cooked. For the soup I peeled half and left half alone, and it made NO difference, so skip that step! That looks tasty! Thanks for the link. I will check it out. Yum! I love butternut squash soup. I agree with you on the cashews. Hmm. Coco recently posted..Wine In A Can? 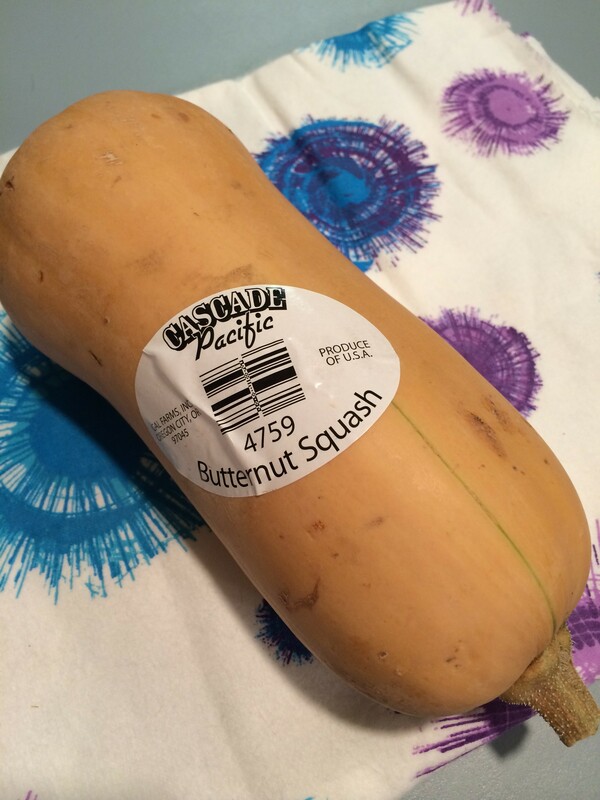 Butternut squash is my favorite vegetable! My go-to squash soup recipe is from Barefoot Contessa. I use granny smith apples for more tart/savory soup. That sounds delicious! Thanks for the link. I’ll check it out. Yum that looks good! I have never made anything with butternut squash. Until a couple of years ago it was hard to buy it here but now it’s in the stores. Might try something with it sometimes. Oh in case you are interested: my latest blog post is about a hike I took Saturday with Bella. You might like it. Thanks for the recipe! 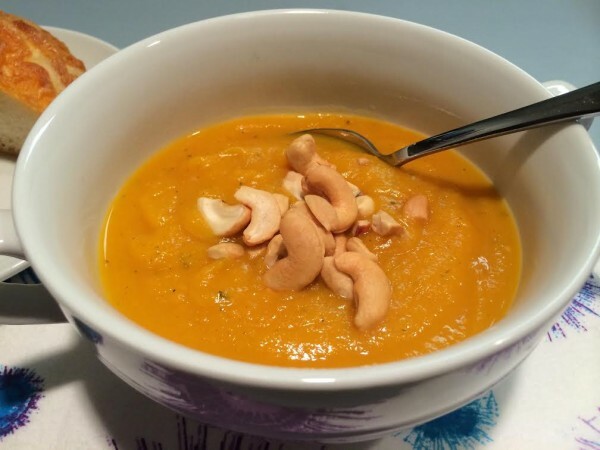 I just made a squash soup last night, and used pumpkin seeds as a garnish – maybe I got some bad seeds, but I think cashews as a garnish seems a lot better! I hope you like the recipe. I liked it a lot!